Firefly is the kind of muscle intensive device that would benefit greatly if served by a crew of athletic young technicians, rather than ….. well…..me. 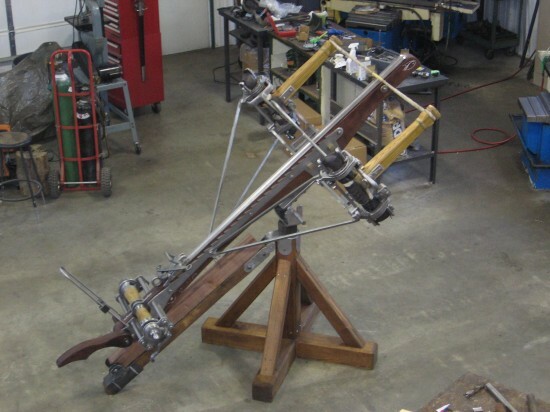 The ancient Lightning ballista, referred to in previous posts, was apparently wound up by a couple of dudes applying themselves to a pair of spoked wheels. No doubt a couple of young Schwartzenegger types were chosen for this task. Firefly is having a good old think about what she would prefer in terms of a pit crew. The Rebecca has rendered an opinion on the new stand. “Nice…”, we are told, “… but if it gets any shinier it will detract from the machine itself.” This is the problem with with being mildly OCD, you can never quit fiddling with the background. Messing around with details, I managed to get the trunnions cut to length and capped to restrict lateral movement. Firefly’s balance is easily adjustable within a range sensible for good shooting. The square headed nuts are a concession to modern fastening techniques and the need to disassemble the machine as required to make progress on new designs. From what I’ve seen of Roman metalworking, it would be pretty easy for them to use heavy rivets in place of the nuts and bolts seen here. When we finally settle on an ideal balance point, perhaps I will make up a simpler, non adjusting version of the trunnion bracket. Occam would prefer that; parsimonious little fashionista, that he is. As this halftime show continues, the reader should not get too discouraged for fear the main event will never arrive. 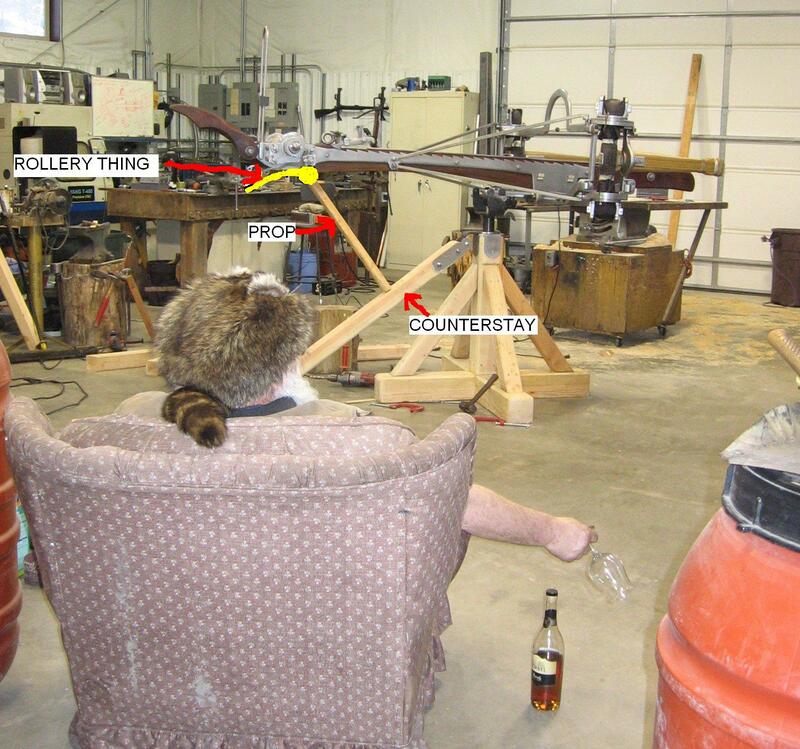 Shooting is relatively near, at least in catapult time. I have been counseled by the Immortal Catapult Deities that under no circumstances am I to have a go at using the new hand winch until the cocking levers are finished to the Nth degree, whatever that is. It’s an eat your brussel sprouts first kind of thing. 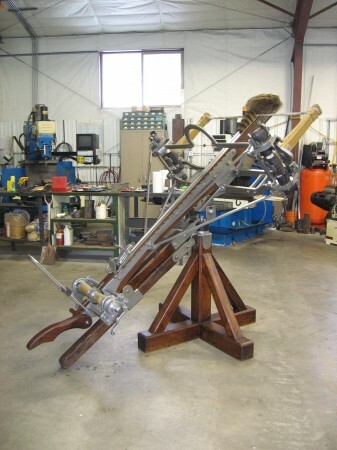 These cocking levers, with their spring assisted pawls, alloyed steel shanks and hickory staves, are going to have a very high opinion of themselves. Here’s praying they work as well as advertised. 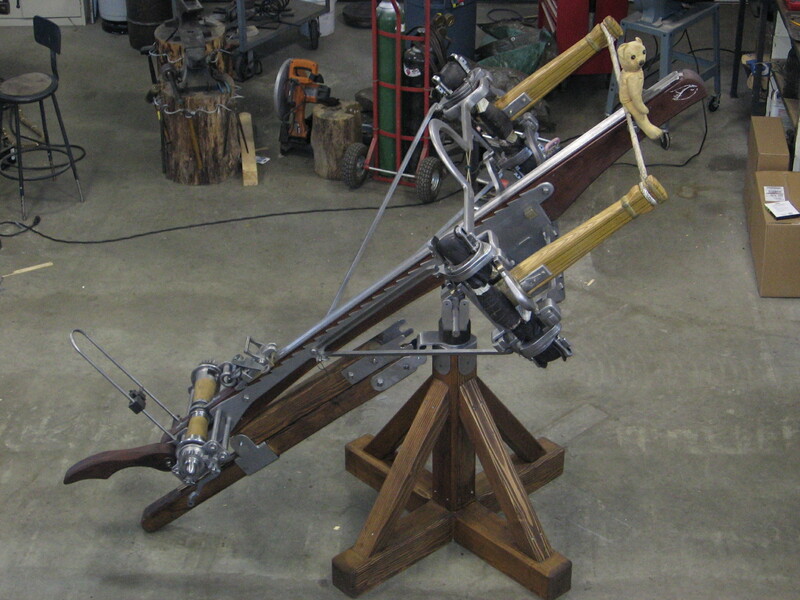 From the description rendered by Mr Anonymous of the Lightning Arrow Firer that I posted a few days back, one thing seems self evident, Mr. “A” was deeply impressed with the machine that he saw demonstrated along the banks of the Danube. Now it may be that this shy and ancient author was the type of fellow who was easily impressed. On the other hand, in the late Roman empire, Mr. Anonymous probably had plenty of opportunity to witness all types of torsion catapults. That he should call such special attention to the “lightning arrow firer” as: “….essential for the defense of fortifications, is superior to any others in velocity and power”, says he at least believed that this new iron based machine was an improvement over any of its predecessors. It is interesting that he mentions only “iron” and “sinew” as construction materials used in the Lightning. 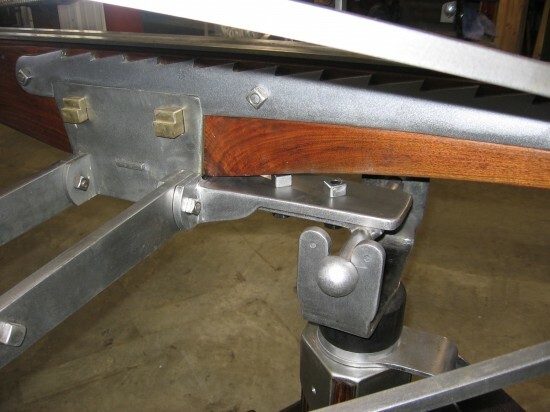 Probably the stock was still made from wood, but it seems logical to infer that the machine he is describing used much less of this material than previous models. Superior performance, not much wood, that’s a strategy I can sign up for when making powerful torsion engines. 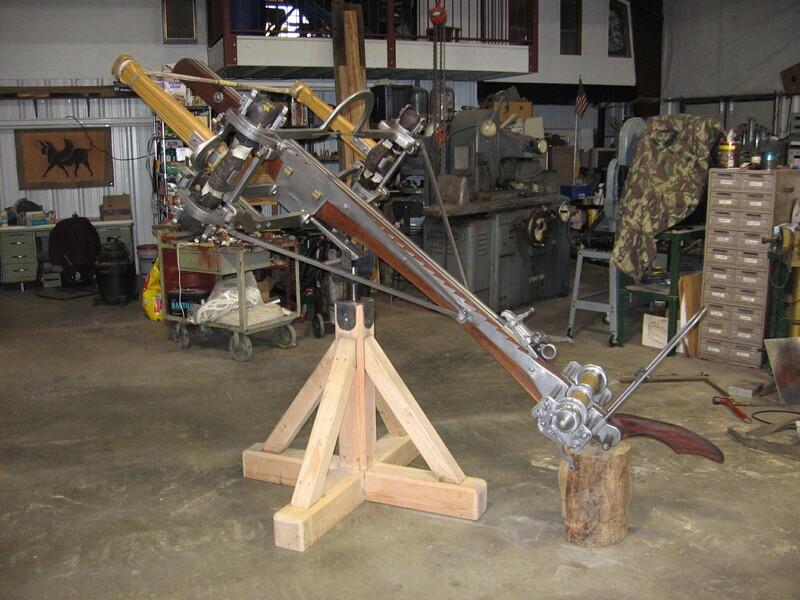 The simple truth is that a ballista made largely from timber, no matter how fancy the joinery or shock absorbing scheme, is always going to be more prone to splitting and breaking under sharp shock loads than a well designed iron based machine. 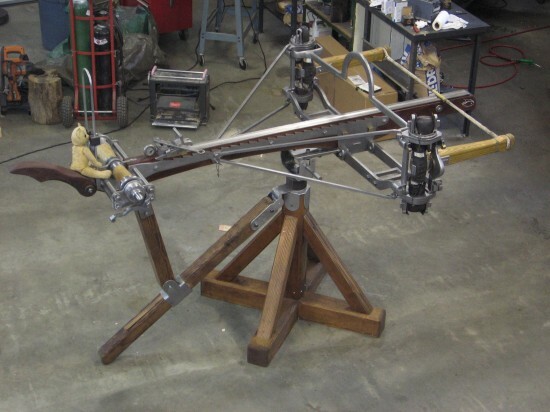 It seems that after centuries of development the Romans finally figured out that wood was an inferior material for making the more highly stressed portions of their catapults. 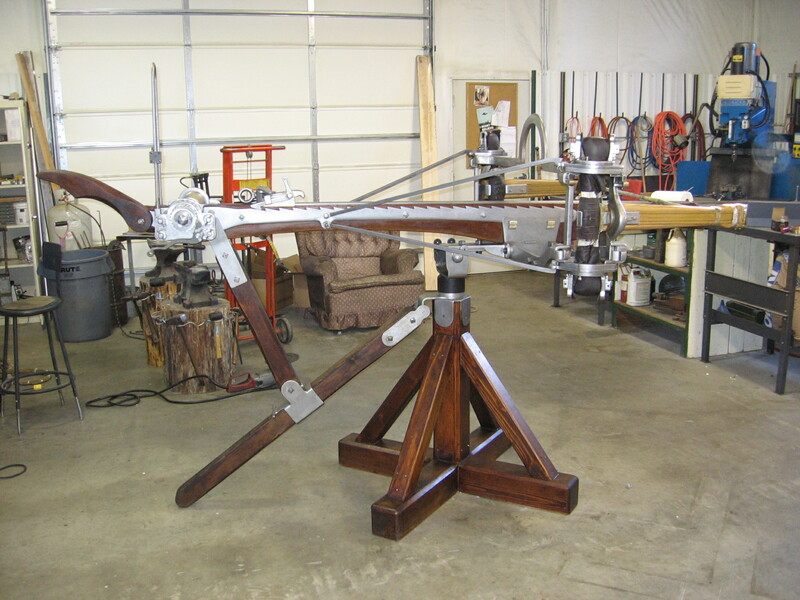 The guild of wooden catapult makers will probably have a major grumble at that one. When they get too loud, I will remind them that by “iron” we also mean, of course, steel. …. Zing! Is that a chisel quivering in my door jamb? Now that she’s on a stand, Firefly’s ability to quickly change her incline has lead to the need for some positive stops on the rails of the steel bolt groove. 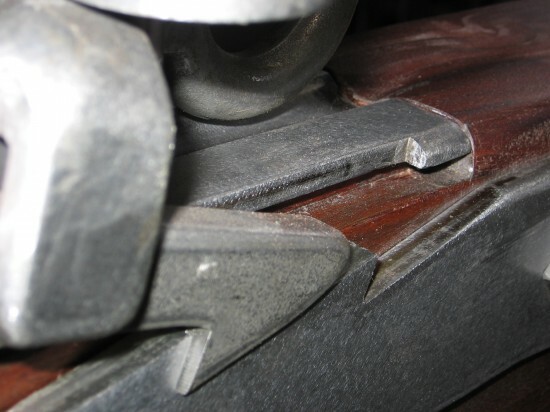 If I am not careful to secure the trigger assembly it has a tendency to run down the rail and clobber the wood when I swing her into an upward pointing position. Some superficial splits in the wood shoulder at the end of the bolt groove have been repaired with epoxy. At least with the ears seen below, Firefly will suffer no more such damage as the result of my clumsiness in managing gravity. On a project like this, the gravity police enforce obedience just when you least expect it. Finally, our favorite beastie gets to pose on a pedestal befitting her rank.